I will continue to use your very good service. I received my extra thick mounts order from you today and just wanted to say I am very happy with it and your service. As an artist I like to be able to appreciate good work. 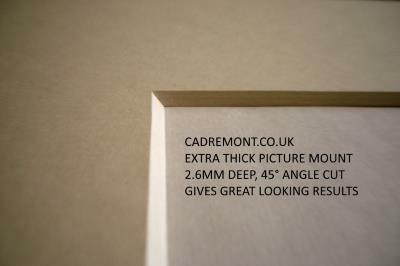 The extra thick mounts are simply outstanding and give some of work the extra depth and gravity I believe they require - and I am selling more of them - which is very good for all of us. Paul / Aaron I've never used extra thick mounts until speaking to you. The quality is A1 and so is the price. Marc / Aaron - thanks. Picture Mounts arrived today - in perfect condition am impressed compared to other ones I have used from other sites. Thank you so much I shall be back! would just like to thank you for an excellent service and quality mounts, i will be making another order - hopefully correct this time - next week. A very quick message guys, Im using your extra thick mounts for all my portrait work jobs, just wanted to let you know the feedback Ive had off all the families - is 'wow'. That seems to be the general reaction from everyone, when I ask what they the image (obviously) but also the way the final product looks for them. As long as Im still getting the work coming - I'll still be ordering from - keep up the great work. So glad Ive finally found a reliable supplier. I found your site some months ago as I wanted some double mounts for my water colour paintings. Your site does have clarity and I was further impressed with the fact that my mounts could be the size I wanted. I came back to the site without hesitation for a second order and I will be back again. I will also recommend your site to some of my chums.